meaning content caching and streaming are provided in the edge for best possible viewing experience. scalable TV CDN solution. 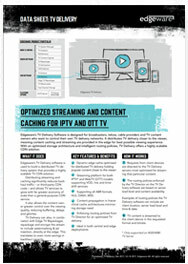 Distributing streaming and caching significantly reduces backhaul traffic – or third-party CDN costs – and allows TV services to grow with far greater economy of scale than a general-purpose CDN service. It also allows the content owner greater control over the viewing quality, reducing buffering, delays and glitches.